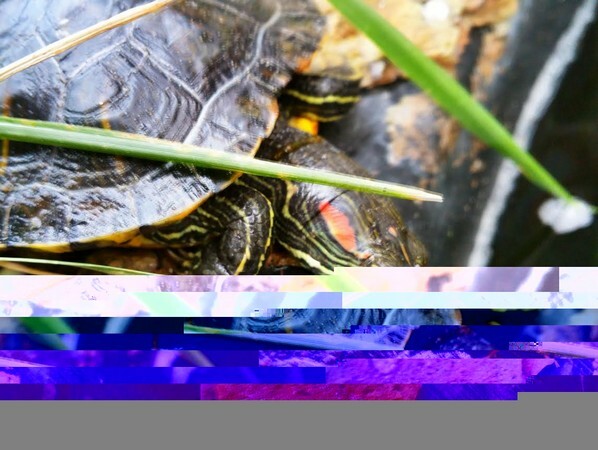 Turtle Death - the notWildlife Blog - A collection of high quality backyard wildlife photos. Today we are mourning the tragic loss of Shellby, the red ear slider as we are heartbroken to share that we’ve just confirmed he has lost his life due to a currently unknown reason. Shellby was a compassionate and devoted reptile who spent his days swimming and playfully interacting with the other pond life. He was often the life of the party, always happy and smiling. He never failed to pop his head out of the water as you passed by, just to say hello. He didn’t mind if other turtles piled on his back even though he was the smallest turtle of this pond. If there is a heaven for turtles, I am sure that Shellby is there. Basking in the eternal sunlight, still smiling and making others smile. Shellby, you will be missed by all who have met you.